In three days Jesus will have a birthday. My children will wake up in the early hours of the morning and go downstairs to see the wrapped presents we placed under the tree the night before. They will go and see what Santa placed in their wool stockings they hung over the fireplace. They will play with the unwrapped present Santa left while they wait for us to wake up. This year my husband has a job. This year my husband has a paycheck. We have money to buy presents. We have money to buy food. Ten years ago, my husband did not get his paycheck in December. The company he started with two friends did not get paid by their clients. We had no money to buy presents. We had no money to buy food. The air in Minnesota felt colder. The snow felt deeper. The doorbell rang. We went to open the door, but there was no one there. On the floor of the front porch was a box of groceries: peanut butter, cereal, Kraft dinner, canned soup, and a turkey. The phone rang, a friend asked me what the children wanted for Christmas. She bought each child one gift and gave them to me to give to our three children. Her name was not on the gift tag. When we went to church the Sunday before Christmas, friends gave us gift cards to the local grocery store, and handed us cash. I had enough money for food and I had $5.00 to spend on each child. The snow did not seem as deep. The air felt warmer. I saw Jesus in the hands that gave to our children. I saw Jesus in the feet that brought us food. 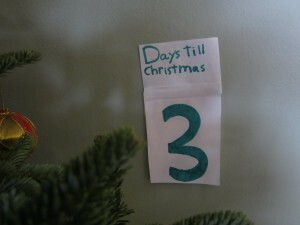 In three days we will sing. Please tell me when you saw the hands and feet of Jesus at Christmas. Please tell me in the comments. I would love to chat.